Welcome to The (Legendary!) Rate My Space Decorating Competition! 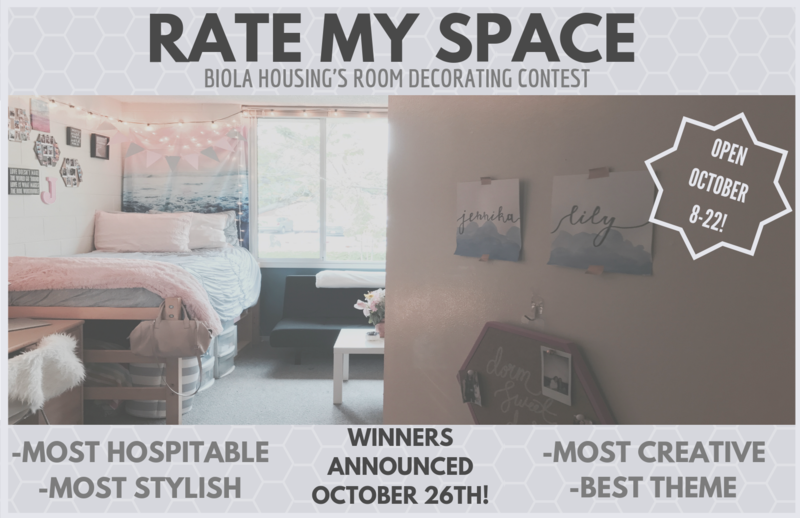 This was the 7th annual Rate My Space Competition brought to you by Biola Housing! In case you aren't familiar with Rate My Space, each year Biola Housing has celebrated the creativity, style, joy, spirit and life that Biola Residents create in their Residence Halls and Apartments. New this year: Instagram "People's Choice"! We are so excited for our winners and record number of participants this year. Interested in entering your room in the competition? Download the Rate My Space Entry Form and turn it in by the deadline on Friday, October 19th before 4:30pm! See photos from more participants on Pinterest!